Best for: Those looking for a quick read that’s mostly about Hillary Clinton’s run for president. 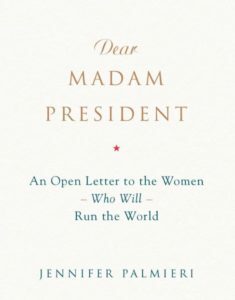 In a nutshell: This is “An Open Letter to the Women Who Will Run the World.” But it’s more a short retelling of some parts of the Clinton 2016 Presidential Campaign framed around the idea that it’s a letter to the first woman to be US President. Why I chose it: I heard the author speak on The Rachel Maddow Show, and the excerpt shared sounded interesting. The concept behind this book is a good one, but I’m not sure the execution worked for me. The book is 175 pages, but each page is probably half the size of a standard hardcover book, so it’s a very quick read — I started it at 9:30 PM last night and finished it just after 11 PM. It moved me, and it frustrated me, and it angered me. So in that respect, it certainly got me thinking. But I think it’s a bit of false advertising. It’s really a short review of the Clinton campaign, with a few anecdotes from the author’s time in the Bill Clinton and Barack Obama White Houses. The author means to take lessons from the campaign and share them with readers (specifically, woman), but after sleeping on it and thinking about it more today, I think the concept wasn’t realized in as strong a way as it could have been. There are clear nuggets of wisdom in here, and there are interesting stories that illustrate them. But I think the book would have worked better for me if there had been more concrete suggestions. Or fewer. It’s in the middle space for me, where the book is not long enough to dive deeply into this issues, but is too long to be a tight booklet with a more coherent message. The overall idea is that we (women) need to stop looking at the way men do things and aim to be like them; instead, we need to be like us. I don’t disagree that women are judged differently (and Ms. Palmieri certainly provides loads of great examples of this), but something about this premise felt as though it were lumping ‘how women act’ into one bucket, and I’m not okay with that. I do think the book is worth a read, and I’d be interested in reading what other women think after reading it. Share the post "A Lot Going On Here"